With today’s technology there are a lot of ways to make sure your pet is well taken care of and safe. Well this Plexidor is basically an updated version of the classic doggy door. It works as a garage door would, only instead of hitting a button this has an RFID chip that clips to your pet’s collar. Then whenever they get close to the door it will slide open. Which thankfully means that you won’t be stuck up at 7am on a Saturday when they suddenly feel the need to go outside. Also an extra bonus is that this little door won’t go flying open over a bit of windy weather. It is made of the material used to make football helmets, which is definitely good when you’re concerned about burglars or small animals. No one likes to wake up in the morning to a raccoon sitting on the kitchen sink. 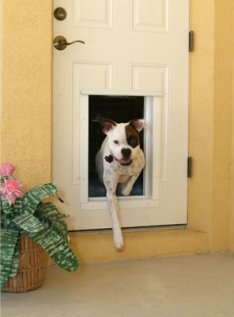 The door also has a safety mechanism to make sure that your pets won’t get their tail pinched in the closing door. The doors range in prices from $129 on up to $800 and come in both white and bronze.